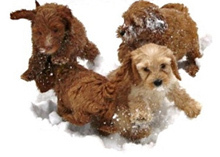 Due to some families waiting for Spring, we have two puppies available from Yazmen's litter. This litter is amazing. They are just wonderful pups with great personalities. I can not stress enough how much we are all in love with this litter. My daughter and her friends are constantly cuddeling with them. Some like being held more then others, some are lickers and some snuggle into your hair. They play nice in the livingroom with eachother and listen to commands such as "leave it". They go to the vets on Thursday for exams and vaccinations. If you are interested we are scheduling visits. Check them out on our puppy page. The only one definately spoken for is Purple girl, she is staying here.